The Portfolio Accounts form the back-bone of, and underpin the TimeToTrade accounting system and Capital Gains Tax Calculator. 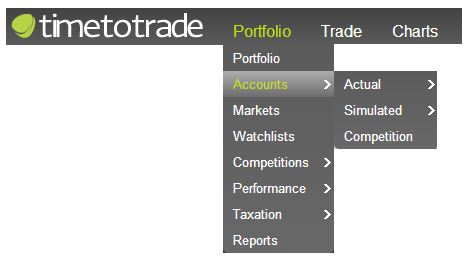 You can access your Portfolio Accounts using the Portfolio navigation as illustrated in the following screen shot. Your Portfolio Accounts are used to capture all cash and investment transactions, which in turn enable taxation and performance reporting to be calculated in TimeToTrade. In order to accurately calculate your Capital Gains Tax and/or determine you true investment performance, we recommend that you set up your Portfolio Accounts to replicate all of your broker and investment savings accounts i.e. create an individual Portfolio Account for each broker and bank account that you have. In order to accurately generate Performance and Capital Gains Tax reports, you should input ALL your historic income, expenditure and investment transactions into your Portfolio Accounts. The reason you should input all historic transactions is due to the complex HMRC Share Identification and Share Pooling rules. Failure to input all transactions could result in shares being matched incorrectly and in turn Capital Gains being calculated incorrectly. You can change the name and the base currency associated with this default account by clicking the 'add/edit' button. If you have multiple accounts, such as a bank account plus trading accounts with different brokers, you can set up additional accounts in TimeToTrade to reflect this; for more information see the 'how do I add additional accounts' section. You can also set up accounts denominated in different currencies - useful if you invest in overseas equities or have overseas bank or broker accounts. The system default 'main' Portfolio Account is set to British Pounds, but this can be changed to a range of Foreign Exchange Currencies. Whichever currency the default 'main' Portfolio Account is set to, defines the base currency that your overall portfolio is valued against. If you have transactions in multiple currencies, the current exchange rate will be used to value the overseas Portfolio Accounts against the default 'main' Portfolio Account currency. In the above example, the 'main' account is in GBP, therefore GBP is the base currency when valuing the entire portfolio. Once you have set up your Portfolio Accounts you then need to input your income, expenditure and investment transactions into the Portfolio Account. When you have added all your transactions, you can then generate Performance and Capital Gains Reports. SHARES – provides a detailed view of historical share investment transactions and related dividends between the selected start and end dates, plus the open positions based on the selected end date. The share transactions have support for commission and taxation fields such as Stamp Duty Tax in the UK. The dividend transactions support Net Dividend Per Share and Tax Credits. In addition share related options can be entered with support for Puts and Calls and accounting support for strategies such as Covered Calls. Open position automated price updates are available for a range of markets, with the ability to view historical valuations by changing the end date. In addition an extensive range of Share Reorganisations are supported. FUNDS – provides a detailed view of historical unit trust fund investment transactions and distributions between the selected start and end dates, plus the open positions based on the selected end date. Charges can be added to Unit Trust fund transactions. The fund distributions support equalisation payments and group 2 units. Automated fund price updates are not available, however the price can be set on varying end dates to enable the open positions to be valued over time. FOREX - provides a detailed view of historical forex transactions between the selected start and end dates, plus the open positions based on the selected end date. Rollover / overnight charges can be entered for each transaction. Real time high liquidity price feed is available for an extensive range of Forex markets for current and historical portfolio valuations. SPREADBET - provides a detailed view of historical spread bet transactions between the selected start and end dates, plus the open positions based on the selected end date. Rollover / overnight charges can be entered for each transaction. Open position automated price updates are available for a range of markets for current and historical portfolio valuations. To accurately track performance and capital gains, the Portfolio Accounts should replicate all financial transactions at any point in time. When working with the Portfolio tools it is important to pay attention to the selected 'start date' and 'end date', as these dates define the accounting transactions that are displayed. For example if you entered an accounting transaction on the 1st of December 2005, if the date range is set to a 'start date' of the 1st of January 06, and the 'end date' is set to a date of the 31st of March 06, then the transaction that you entered for the 1st of December 05 will not be displayed. To view the 1st of December 05 transaction that you have entered, change the 'start date' to a date that occurred before the 1st of December 05, such as the 1st of November 05. Step 1: Set up your Main Account. Step 3: Import or Manually Input your investment transactions and income / expenditure into the associated Account. Broker transaction and performance reports do not always include all the costs associated with trading, such as trading software, subscriptions to fundamental data, analyst reports etc. The TimeToTrade accounting features enable you to accurately keep track your investments and determine your real performance over time, view historical valuations, generate a range or reports between any time frame, calculate Capital Gains Tax liabilities and generate Investment Club and Private Investor HMRC Investment Tax Returns.